Most recipes are geared to portions for 6 or so, and for people with less than that, or have picky children, leftovers are an issue. What do you do with the leftovers? Make it into something that you like, something that you can recycle! The Persnicketys of the planet do not like leftovers. They need to be disguised, and the best approach is to plan your own menu. -Do not have stew the first night of the week, have tacos. The next day it might become taco soup with leftover corn, canned tomato, chopped onions. Cooked shrimp gets shrimp scampi the next night, and if that doesn’t do it, make a shrimp stew with cream of potato and cream of shrimp, along with some half and half, garlic, and red pepper. Vegetable soup. Keep some chicken stock around, and stock your kitchen with basics like cream of mushroom and chopped or diced tomato. The noodles can become soup with celery and carrots or another noodle salad with your excess meat leftovers. 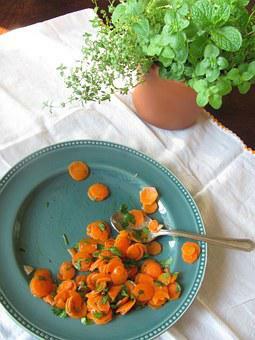 The raw carrots become sauted carrots and boiled carrots and then salad. The roasted veggies can be lunch the next day! -If you prepare twice the quantity of noodles or veggies, you can make soup or pasta later in the week. Extra rice? Anticipate barbecue and sandwiches from pot roast. -Do you pack a lunch on your own, the spouse, or the children? Turn dinner . Cheese crackers be gone! Sour cream, salsa, and shredded cheese may fix, hide, or transform many leftovers. -Make vegetable soup or stew from those vegetables which were a side dish. Keep your vegetable scraps! A very easy and simple way is to puree with broth or half and half. Voila! Add croutons or shredded cheese and you have an instant meal. Another way to use those scraps it to add to a freezer bag, and keep adding. When the bag is full, dump it into a pot. Instant soup, simply add broth and diced tomato. As an alternative, you can boil broth and strain for vegetable stock. -Stale bread gets french toast, croutons, stuffing, or bread to dip in a herbed olive oil. Everything has a solution and can become something new-it just requires a little thought and organization.